In the beautiful Kempton Hall, a simple and wonderful show with vast interpretations of the theme. Booth #16 in Town Center Park–stop by and visit and see earthy art! I am hosted in Studio #5. Click to see the driving map through this beautiful territory and a glimpse of the fantastic and varied art we are making. Last fall we had visitors from Portland and the distant surrounding area, with comments that this is one of the best Open Studios tour in Oregon! Friday, Saturday, Sunday, 6-8 June 2014, 10am-5pm each day. Artist Reception & Artist Forum Talk–Both This Weekend! I have a piece accepted into this show, and our reception is Friday, 16 May 2014, 6-9 pm, at the address above. There will be signs directing you to the exhibit hall. I have been to this show twice, and it has been beautiful work in a beautiful space. My work in this show is “Compassionate Conspiracy,” which you may have seen before, and possibly worth a contemplative review! 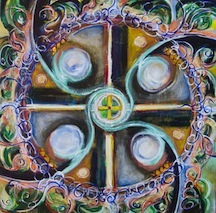 It is about having your sacred-circle-life-arena, and noticing leagues of spiritual support holding and nurturing you! The other two pieces I submitted for the show with such a wonderful conceptual title– “A New Heaven & A New Earth”– are “Stitch Your Soul To A Sacred Hoop” and “First Innocence.” The former offers the strength of quadrants with earth-like embellishment of the stained glass motif. The latter offers a glimpse into land meeting sea, and orbs of spirit light assisting creatures and beings in their interface with one another and with the integrity of being. Alas, neither of these will hang in that hall for this show! The Artist Forum is Sunday, 18 May 2014, 9 am, also at the above address, and I will be speaking. Please come visit! See art! Enjoy a lovely evening in Portland! Introduce yourself! Sending LIGHT! 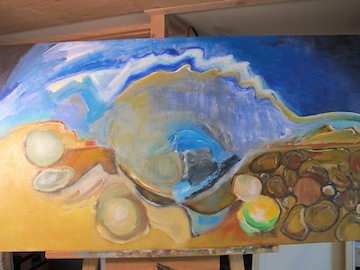 “Oh my goodness,” says I. I brought out a 24″x48″ canvas and had to grin at its foreignness. It is broad. Not square. It is long from there to there. 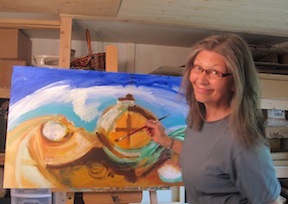 During my studio sessions I felt there were several different paintings going on at the same time on the same canvas. I usually work on more than one canvas at a time, but they are separate pieces. I was delightedly uncomfortable with the literal space, and then when it became too pedestrian/popular in its palette and symbolism, I found myself going away from that sentiment. Dimensional change is quite the life reflection! 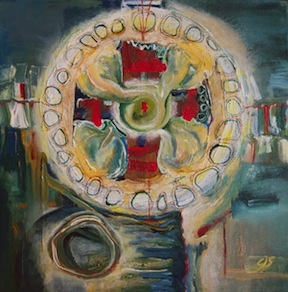 I kept with the four sacred directions theme, the weather came into the piece, I took memory walks across the southwest, and then the wind storms of the San Luis Valley came in to bring the life. My finished broad art is the way that high mountain valley feels, with the dirt flying and making the sun red, with tumbleweeds racing, with the walking over the unseen aquifer, and Mount Blanca looming from its 14,000’+ vantage point. something you never did and still do not understand fully. 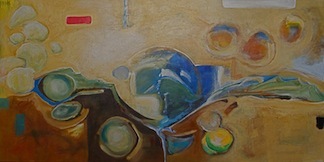 The “simplicity of confusion” can be a big delight when it is not being fussed over!